Do you need any encouragement to let summer go and welcome fall? After a summer filled with health, fresh air, and exercise, I do need a few incentives to contentedly say farewell to the sun. Yet autumn eases me in gently. Treats like pumpkin cookies help me to truly feel excited for colder weather and family times around our wood stove. These Paleo Sugar Cookies with Pumpkin Glaze are tender and traditional, yet made with grain-free flour and unrefined sugar, for a healthier seasonal favorite. The Pumpkin Glaze envelops the spices that help us welcome in cooler weather and holiday activities. The recipe comes together quickly for an easy treat! About fifteen years ago I was first treated to a glazed holiday cookie like this one — tender, light, and moist. The glaze made the cookie even more special. A set glaze not only gives a nice texture to the cookie, it also makes the cookies stackable without any sticky mess. Which Grain-Free Flours Do You Need To Make These Paleo Sugar Cookies? I call for two grain-free flours in this cookie: coconut flour and a (preferably sprouted) nut flour of your choice, such as pine nut flour, blanched almond flour, or another flour such as macadamia or cashew. Instead of purchasing a nut flour, I like to blend my own “crispy” nuts into flour. Crispy nuts have been soaked in salt water and dehydrated before use. Soaking reduces phytic acid, making the cookies easier to digest and more nutritious (source). Learn how to soak nuts here. This traditional preparation method does require a dehydrator, but if you have one, it’s truly a fast and easy process. I choose to use pine nuts! Pine nuts are actually a seed, rather than a nut, mild in flavor, with a mild pine essence that is lovely for making flour! Note: When blending crispy nuts to make flour, be sure to use a food processor, not a blender, or you'll end up with a chunky nut butter texture. If you choose to use blanched almond flour in this recipe, no guilt! You’ll be happy with the results. I just can’t help but plant the seed in everyone’s minds to begin looking beyond the almond! 😉 Little by little it would great for more humans to make these small buying changes so that over time we become better stewards of our planet and better caretakers of our bodies. Personally, I reserve blanched almond flour for very occasional recipes. I make my own sprouted nut and seed flours the rest of the time. A doable balance. I love cocoa butter — a healthy saturated fat that's high in antioxidants yet contains no caffeine. It's the reason the glaze in this recipe sets! When melting cocoa butter, keep all of your cooking tools dry, as water will make its texture and chemistry change. In this recipe, you’ll melt cocoa butter in a small, dry skillet then simply whisk in the remaining ingredients to create the pumpkin glaze. The flavor of the glaze retains strong hints of cocoa butter — a rich, delicious, and satisfying fat. 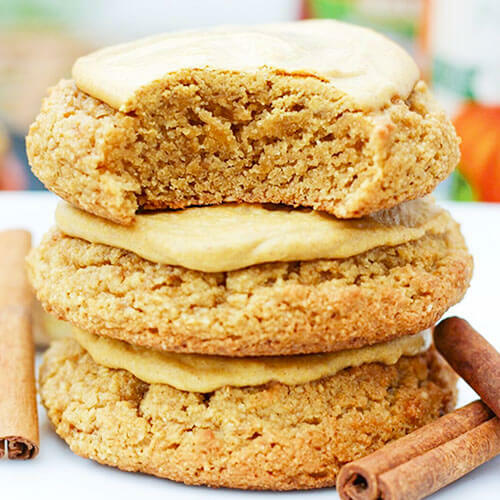 Get excited for colder weather by indulging in the best Paleo Sugar Cookies ever! Soft, chewy, and traditional, yet gluten-free and grain-free, this easy treat is decorated with a spiced pumpkin glaze that screams fall desserts. I call for coconut flour and a nut flour of choice, such as almond, in this simple, healthy recipe. 1 cup nut flour preferably sprouted, such as sprouted pine nut flour, blanched almond flour, macadamia flour, cashew flour, etc. Line cookie sheet with unbleached parchment paper or Silpat baking mat. In large bowl combine dry ingredients: nut flour, coconut flour, coconut sugar, baking soda, and sea salt. Stir to mix. In medium size bowl whisk together wet ingredients: maple syrup, butter, egg, vanilla extract, and apple cider vinegar. Pour the wet ingredients into the dry ingredients. Fold them together well, without over-mixing. Use a 2-ounce cookie scoop for larger cookies or a smaller scoop for smaller cookies. Portion batter onto prepared cookie sheet. Bake cookies for 12 minutes until golden brown all over, but not too dark around the edges. Allow cookies to cool 10 minutes, then loosen each cookie from the unbleached parchment paper or Silpat baking mat. Place cookies in the freezer (this helps the glaze to set quickly during the Assembly process). Freeze cookies 15 minutes while making the glaze. Place cocoa butter in small dry skillet or saucepan. Heat over medium heat until fully melted. Pour melted cocoa butter into 1/4 cup measuring cup to make sure you have 1/4 cup melted fat. Using a soft rubber spatula, scrape cocoa butter into small dry mixing bowl. Add remaining glaze ingredients: coconut cream, pumpkin puree, cinnamon, ginger, and stevia. Use a dry whisk to fully mix the ingredients. Remove cookies from the freezer. Use a spoon to ladle a couple teaspoons of glaze onto each cookie. Use the back of the spoon to spread the glaze evenly around the top of the cookie. Allow glaze to set (the partially frozen cookie will cause this to happen) and cookie to come to room temperature. Serve or store covered in the fridge for later. Want a GAPS Diet version of these cookies? 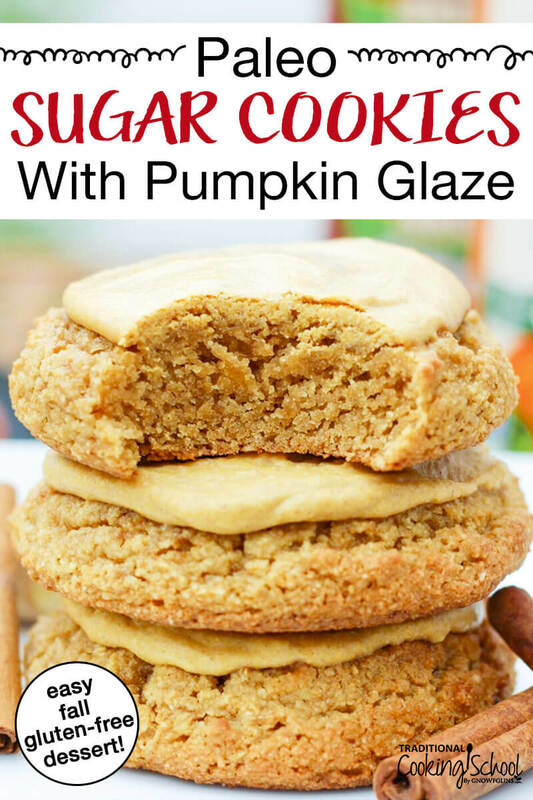 Find a recipe for a GAPS Diet Giant Pumpkin Cookie with Buttercream Frosting here! Do you make your own crispy nuts? Do you have a dehydrator you love? Will you try these Paleo Sugar Cookies with Pumpkin Glaze? These cookies look delicious but I’m not familiar with some of the ingredients. Where do I find coconut sugar and cream and cocoa butter wafers? Depending where you live many large grocery chains now carry these items. If not, any local health food store (natural foods store) or a Wegman’s, Trader Joes, Costco, etc. has these grocery supplies now. Or if you prefer online shopping, both Amazon and Thrive Market are a good source for supplies. These look delicious. I noticed there is no egg in this recipe. Could it also be considered vegan as well as paleo? Hi Donna, there is actually 1 egg in the recipe, sorry. If it was actually egg-free, and the butter was replaced by coconut oil, then it would also be a vegan recipe. So happy I found this website. This recipe looks amazing and we know so many people who need healthy treats this season.